Some things are worth 4 euros – a little more than five bucks. Like watching a production of Charles Gounod’s Faust in the Vienna State Opera House – the preeminent opera house in the world. For a 7 P.M. show last week, I was in line for standing tickets two hours prior – behind 70 people or more. In all, 200 hundred of us squeezed into a few rows behind banisters in the back of the 140-year-old legend. If you make it to Vienna, you have to do this. You can buy floor or box seats for more than 150 euros (190 U.S. dollars), but get the cheap seats. That way, even if you stay for a half hour, you can walk into that fine building and say you saw among the top opera in modern world knows. Yes, you’ll be cramped and you have to get there early. Wait in line along the left side of the building and be prepared for a lot of standing, pushing, closed quarters and crabby elderly people who are only there because their tour book told them to be there. But, understand, Vienna is the world’s top opera town. Forget that while walking to the state opera house I passed where Wolfgang Amadeus Mozart (1756-1791) was buried. Vienna also has the Vienna Konzerthaus, home to the Viennese Symphony Orchestra and the Musikverein, another classical music hub. 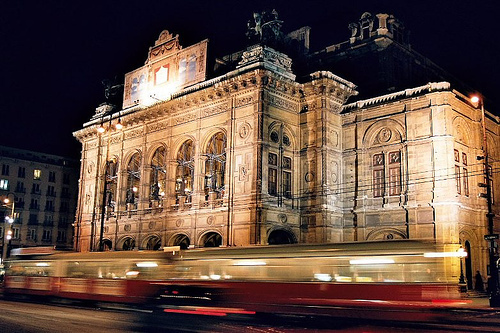 All three considered among the top classical music concert halls in the world. So, of course, you get top talent. Squeezed in the standing seat-area, waiting for the show to begin, I met a few fellow Americans – the place was crawling with them, a first for this trip. One was an opera hound and raved about the performance of Faust we were about to see, though the story was hardly one of his favorites. Rather, he was adamant about our appreciating the fact that we were about to see performances from Roberto Alagna, a French singer of Sicilian descent and world renown, and his second wife, famed Romanian soprano Angela Gheorghiu. As first posted on WeDontSpeaktheLanguage.com.